During SupportYourApp’s early days, we already knew we had to find a better solution for customer support than using Gmail. We decided to take the long and arduous road, and built our own in-house customer support help desk software called qCRM. But not every small company has the resources to create and maintain their own customer service software like we did. And even those that do need to consider whether it’s worth their time to create a custom system from scratch. 1. How will it scale? 2. How expensive is it per user? Assigning and distributing tickets to agents who may leave comments and share relevant information with other customer support agents. Letting you manage all support tickets from email, phone, and social media in one organized place. Allowing you to track the statistics of every support request. For example, stats like total resolution time, average reply time, call duration, and overall resolution ratings. Investing in help desk software is a great way to stay on top of every support request coming into your system. Help desk software is an awesome tool to help your team streamline customer support by allowing your support staff to work more productively with features like ticket management, community forums, live chat, phone support, analytics, etc. Help desk software allows you to easily create knowledge bases. With resources like video tutorials or an FAQ section, you will be able to provide answers for repeated questions in your knowledge base so your customers will have support anytime they need it. You Know You Should Get Help Desk Software, But The Question Is When? All else equal, it makes sense to invest in software eventually. But when? From what we’ve seen from one of our clients at SupportYourApp, Shortcut Labs (creators of Flic) it is never too soon to ditch Gmail for full-fledged customer service software. After the launch of Flic, Shortcut Labs continued to use Gmail to support customers, which led to painfully slow customer support and terrible reviews until they teamed up with SupportYourApp. SupportYourApp’s help desk software qCRM has allowed them to collaborate with their customer support agents and cut down average support reply time from 45 days to less than 24 hours. When it comes to making your customer support even better, the short answer is: the sooner the better. With help desk software, you can easily integrate all support channels, create a knowledge base, and establish KPIs from the beginning of your product launch. This way, when workflow increases and customer demand immediate attention, you will be more than ready. This one was a no-brainer for us since our main business is providing customer support for companies. But for everyone else, customer support may not be the highest priority right after launching their product. If you’re in this situation you may feel that it’s okay to put off a help desk for another day – but with many free starter help desk options, you should start to use a help desk to organize support immediately. [When is the best time to get a help desk?] From the very beginning. Instead of using traditional email for tickets, use a help desk. So as your team grows, they can look back at the archive of how you handled them. Not only will a help desk organize your work when you first launch your product — features for creating FAQs and other self-service support options also help you avoid a bigger customer support workload in the future. You can continue forcing your developers to answer customer support emails, but this will quickly crash and burn when more customers come in. Developers can’t afford to balance customer support work and develop your product at the same time. Not only will your customer support suffer, but your overall product as well. Investing in help desk software the moment they got overwhelmed saved Sennheiser’s support staff from getting overwhelmed and losing productivity. Being in the customer support industry, one of the most frustrating things that comes with the job is answering a question, only to get the same question two minutes later. If you don’t work directly in customer support, this can be amplified by the fact that you always have something more important to focus on. Not only is this super distracting, but it’s also very inefficient. According to a Capterra help desk software study, respondents said that behind email integration, FAQs were the most commonly used feature of their help desks. FAQs are one of the best customer support resources to have available and investing in a knowledge base to make your customers’ lives easier is one of the best things you can do for your business. FAQs also allow your customers to have customer support anytime they need it (helpful in case you don’t have 24/7 support). Whether it’s now or later, a help desk is always a good way to help increase productivity in your company and keep the customer support clutter at bay. I think this best describes how things can turn fruitful by right timing. Usually I prefer buying at the time of launch which in turn gives lot opportunities for trial and error. 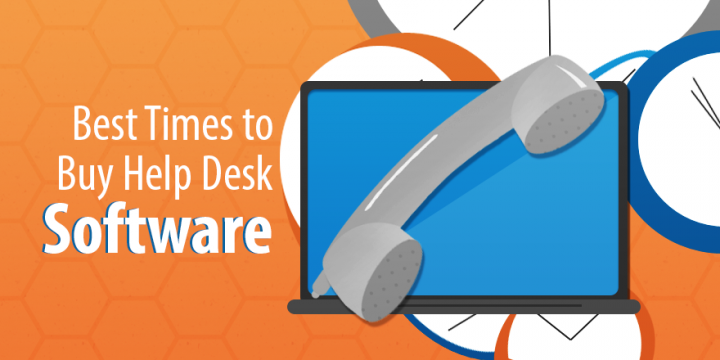 Often we’ve seen organizations ending up investing in wrong help desk software. There is still lot of education that can be provided around this and lot of help can be taken around the globe as well. With websites like Software Suggest, softwareadvice do helluva job for this.